Ever wondered why Calicut, with its centuries of contact with the Chinese, did not have a single Chinese net, whereas Chinese net has almost become the mascot of Cochin? After all, more than Cochin, Calicut and Quilon had longer and more sustained trade relationship with China in the 14th and 15th Centuries. The greatest of Chinese mariners, Zheng He is reputed to have visited Calicut seven times and had even left a memorial plaque to mark his visits. He is believed to have died in Calicut during his seventh visit and his body was buried in the high seas off the coast of Calicut. 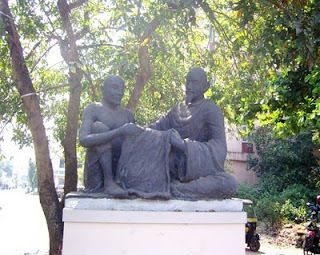 Calicut and Panthalayini Kollom were reputed to have had enclaves of Chinese settlers. While Calicut boasts of a Silk Street where the Chinese traders had been peddling their ware, Panthalayini Kollom still has a Silk Bazar where similar trade must have been conducted by the Chinese mariners. Then, there is the evidence of travellers about the existence of Chinibachgan or the Children of the Chinese in Calicut, although there are other interpretations too for the source of the word. It could also not have been the lack of suitable water bodies for fixing the nets, for the Chaliyar, Akalappuzha and the lagoons of Kadalundi offer locations comparable to the backwaters of Vembanad and Kochi kayal. Wikipedia suggests that ‘some believe’ that the Chinese nets were introduced into Cochin by Zheng He, the great General of the Ming Dynasty. If so, why did he not introduce the nets into Calicut? More pertinently, did Cochin exist as an important port during Zheng He’s visits? The net used for catching the fish is called rede, its edge is borda, the arms of wooden parts which hold the extensive net together is brasao, while the flexible ring on the top on which the entire brasao moves is argola. In addition there are Corda and Pedra for balancing the movement of the net. There is Caluada on which the fishermen moves up and down and the posts which support the entire structure from the river bottom are called Odora. Incidentally, the Portuguese settlers had also introduced the wok which is called cheenachchatti and the delicacy known among the coastal Christians of Cochin as cheenasampal. Finally, the catch from the Chinese nets when dried is called bakkal (vakkal) which is derived from the Portuguese term ‘Bacalhau’. 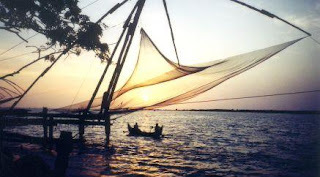 As Portuguese settlers ( Casado means ‘married one’) were not welcome in Calicut, the net also did not reach its shores! Good question. Macau, though colonised by the Portuguese, was then (as now) part of China. Maybe it was a Chinese way of catching fish which the Portuguese had borrowed. Is it something to do with the food habits of early residents of Calicut? Even now you come across very few people fishing in the backwaters in Calicut and Malabar, whereas it is a common sight in the South. So probably that's why the Chinese introduced these nets in Cochin. The point is that these Chinese nets were not brought by the Chinese mariners themselves but much later by the Portuguese settlers of Macau. These settlers could not have come to Calicut shores as they had a hostile relationship with the Moplahs. So, there is nothing 'Chinese' about the Chinese nets, except that Macau was (and is, again) a part of China. Many thanks, Maddy. We would have been sorely disappointed had you not commented. Hope you have seen Deepa Leslie's article. While you are researching, please consider whether Cochin did exist at all in the 12th and 13th centuries, as it is believed that the floods in Periyar (1341 AD) choked Kodungalloor and created Vypeen, causing the shifting of trade activities to Cochin.Look forward to your insights. We have started a blog recently about the malabar. Would love if we could have some of your posts there. As I have understood, Cochin never existed as a sea port during the 12th and 13th centuries. You are free to provide a link in your blog! Thanks. PNS - Many thanks . We should await Maddy's findings.If the Pattanam archeologists come up with evidence of Chinese fishing nets, the whole theory will crumble, I am afraid!! Have read this article in The Hindu, even i used to think about it..very nice read..and the picture is not from Blooming Calicut but Booming Calicut. Thank you, Sanjay for pointing out the error. We got confused between Booming Calicut and KUSDP (ADB's) Blooming Calicut. Apologies!